For my first meal in Vegas, I wanted to stay close to the Mandalay Bay. I went with Jenna‘s suggestion of heading over to the Luxor’s mexican spot for veggie tacos [that could be veganized], Tacos & Tequila or T&T. There’s something that’s sort of eerie to me about being in that mostly unadorned pale pyramid, but you forget that when you enter T & T. The vibe in there is a bit more colorful and cheery, especially with the constant stream of classic songs that have been set to techno beats. Let me tell you, I heard the most unlikely songs layered with a dance track… Eye of the Tiger, Hotel California, Pina Colada, Black Hole Sun, the Rolling Stones, Guns n Roses, etc! They have a $5 happy hour menu that’s a pretty good deal if you just need a snack and want to grab some guacamole and a drink. I however, ordered a mojito and the veggie tacos. When I asked her to hold the dairy (comes with sour cream and crema fresca) she asked if I wanted them “vegan style”. Yes, I said, that would be perfect! : ) Heres the regular menu. After a while she asked me if I wanted chips & salsa. Really, she forgot and was getting some for the newest additions to the bar, but oh well. This particular bartender seemed to barely have her head above water the whole time. She was apologizing to everyone. I’m gonna go ahead and just assume she was new. The other girl was on top of her game. They serve the chips with a red & green salsa. Both taste like roasted tomatoes, and neither one was spicy, too bad about that. These were super delicious. 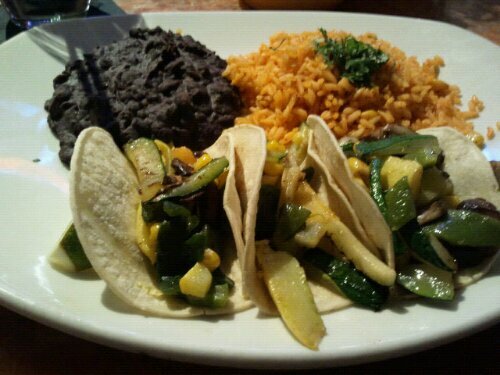 It was a really nice combination of flavors from the roasted veggies, and I dumped the beans and rice into the tacos too, and ate two of them as soft tostadas. They tasted great with a squeeze of lime (wedges provided) and some of the roasted tomato salsas. The tacos are actually really tiny and the serving sizes are lunch appropriate, but I still left full and happy. So if you’re hungry, make sure you get the chips and salsa too! Tacos & Tequila is located one level up from the casino, where the BODIES exhibit and Carrot Top’s comedy theatre is. Open daily 11AM – 11PM. Happy Hour is Monday – Friday from 2:00 – 6:00 pm. We’re leaving soon! My flight leaves @ 6am. I’m hoping Thomas doesn’t get out too late so we can do something.